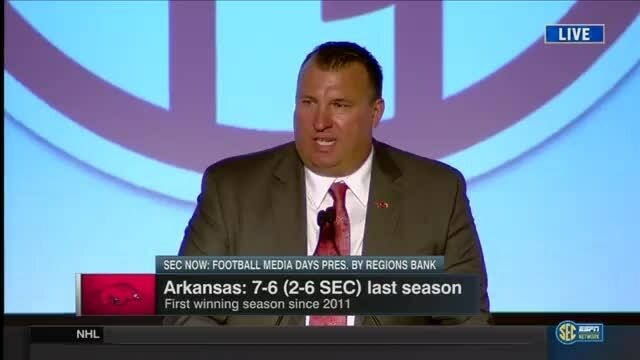 Arkansas head hog Bret Bielema is ready to start at sneaker war. He noticed Mississippi State's Dan Mullen was sporting some Adidas Jeezy Boost 350 and wasn't about to be outdone. So he made a late night order and picked up these bling-laden kicks. Bielema was rather proud that he was able to order the shoes all by himself online and didn't need any help from his wife. "I wore a little bling on the shoes, just to have a little fun," Bielema said. "I saw Coach [Dan Mullan] came in here with his Adidas on and we are a Nike school, so I thought -- let's have a little Nike and Adidas war." Bielema says his players love the shoes, and his relationship with the guys in Oregon doesn't hurt on the recruiting trail, either. "You can recruit to Nike, you can recruit to a certain kind of style," Bielema said. In case you missed #MullensShoes trending on Twitter -- here are the coach's kicks from Tuesday's Media Day.